As I’m a raving fan of great suppliers like Namecheap I thought you should know about these deals! 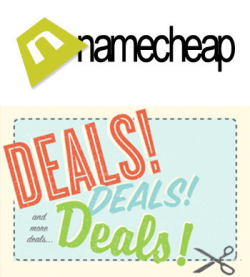 The Namecheap coupon code NCHOLIDAYS will activate any and all of these deals. These offers are valid until 11:59:59pm EST December 31, 2013. Just click here and input your coupon code when you make a purchase. 30% off all Shared and Business hosting plans applied to your first billing cycle, regardless of length. Special price of $9.61 for popular .com, .net, and .org domain registrations or transfers. There are loads and loads and … loads of mobile apps available for both Android and iPhone. I juts had a look and it looks like iPhone and Android are more or less neck and neck with about 700,000 mobile apps each.